I guess that it is true, that all good things come to an end. Whether it is the last drop of a 1961 Chateau Latour or the last night to enjoy being with my Favorite Daughter and her family. It was a bittersweet moment for us all, as I would not be seeing any of them for several months, so I especially had to give my grandchildren a typical “hard-time” from me, or else they wouldn’t think I cared. They had spent the entire day visiting friends and family and we made arrangements to meet for dinner near where they were going to be. I thought that a Detroit “old school” style pizza would be something different for my grandchildren and that it would fill them up. I mean that everyone thinks of the pizzas from their own locales as being great, but there is just something about a Detroit pizza, that is different, and I am sorry, but I just am not a fan of the modern pizzas that seem to be all the rage. 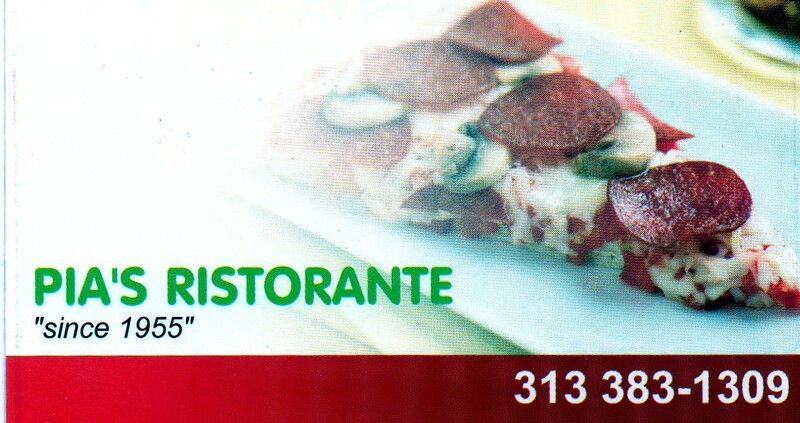 Pia’s Ristorante fit the bill for the menu and for logistics for all concerned. I had really thought that I had been there before, because I had heard about it most of my life, since they had started in 1955, but as I pulled into the parking lot, I realized that this was going to be a new experience for all of us. It was definitely old school as the rooms were large and cavernous with plenty of people and parties having a good time when I got there to get a table for all of us. It was a simple decision to order an extra large pizza with pepperoni, mushrooms, green peppers and hot peppers, though my Favorite Daughter asked that they only make half the pizza that way, and the other half with just pepperoni, as she figured that the kids would enjoy it that way. I also order a large antipasto salad for us all to have as we waited for the pizza to be cooked. It seemed to be a hit, even with the fussy appetites of children these days, so I was very happy. For those enjoying a beer or a cocktail, the drink selection was easy, finding a wine was more of a challenge, but I found something that would work, as it appeared that wine was not a major beverage there, and I understand that not all neighborhoods and communities get excited about wine, like I do. I was more than happy to enjoy some Maschio Prosecco Brut DOC NV. This sparkling white wine from Veneto now enjoys its own guarantee from the government, and I might add that most of the prosecco wines seem to improve in quality each year, as they tweak the processes to get out from under the notion of just being a poor man’s “champagne.” All Prosecco wines are made with the Glera varietal, and now that varietal has even begun being called Prosecco, from all the gains in popularity that it now enjoys. It may be me, but it seems that even the bubbles are getting smaller and more of them, from the old days, and it is just any easy festive drink, and even their Brut is a bit sweeter, which makes it easier for most people to drink it. Also I had hoped that the Prosecco would make it easier to say all the good-byes that I had to say, until the next time. 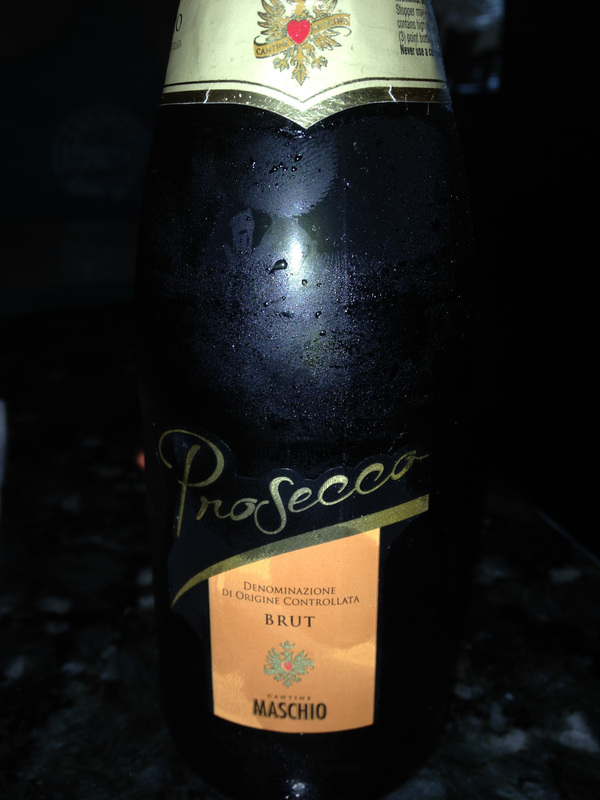 This entry was posted in Dining, Wine and tagged Glera, Italy, Maschio, Prosecco, Veneto. Bookmark the permalink.